Beloved is a film I touched briefly on here before. 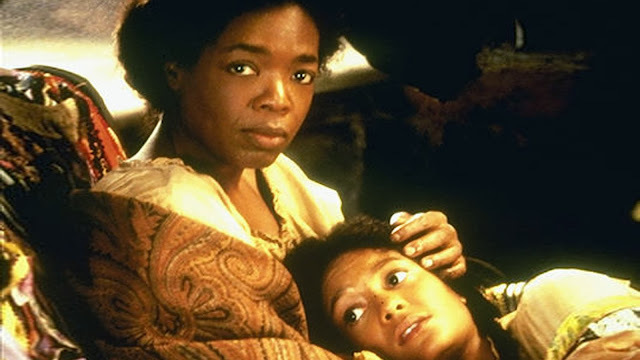 Set not long after the emancipation of enslaved Africans in America in the midwest, a Black woman named Sethe grapples with her enslaved past when she is reunited with the child she bore and slain for fear of being recaptured by her slave master after escaping. Recently watching this for the first time, my visceral and intellectual response was pleasantly mixed and complicated. It was such an uncomfortable movie to experience and at the same time, empathetic and endearing. Some re-affirming academic work as been done on the film by Ellen C. Scott who titled her work, "The Horrors Of Remembrance: The Altered Visual Aesthetic of Horror in Jonathan Demme's Beloved," Jonathan Demme being the director, Toni Morrison, the author and source of content and inspiration. What is profound to note is the film's intimate relationship to traditional horror/the Southern gothic as well as it presents itself as removed from that tradition but broadening our concepts of horror as well as how it positions the historical horror of slavery within the film. Beloved takes us on one journey of the Black American experience of slavery through the body of a Black female protagonist. In Scott's words, "Beloved disrupts horror’s narrative impetus, visual regime, and phenomenological economy to create a different iconography of fear, one that exceeds spookiness and thrill and sheds light on the representation of cinematic horror’s social, historical and cinematic repressed." It is institutional racism, by way of slavery that is the 'boogeyman' (or multiple boogeymen; a slave master and his sons as the embodiment) of this story. In addition, when Sethe is successful in ending the life of her baby daughter to save all of her children from the horrors of slavery, that baby aggressively haunts the house and land she was murdered on. Returning as the 20 year old she would've been if Sethe's oldest daughter had lived, calling herself Beloved, is the living dead. The house and land is eventually cleansed by a group of Black women who recognize Beloved's presence as a detriment to the physical and spiritual life of the space's inhabitants. They are the exorcists. Rather than looking at slavery through the lens of brutality, which would centralize the acts of horror, Beloved allows its viewers to enter the fragmented subjectivity created by horror and therefore to look at the long term psychological effects of this institutional oppression as we follow Sethe, who is both the film’s "final girl" and its historically, regionally, and cinematically fissured subject. In placing us as viewers on the fault lines of individual subjectivity, it drastically shifts the experience and "effects" of watching horror. Visually haunting is the scene where Sethe recalls a sexual assault where the viewers are forced to witness the unspeakable from Sethe's point of view at a low angle. We only hear her terror but we see the menace and evil delight the two men take to squeezing her breast milk from its source to imbibe as if from a fountain. In suggestion of where the true horror lies in the film, Scott implies, "Beloved articulates a vernacularized, gothically strange Black horror aesthetic that complicates and alters the definition of horror’s source, suggesting that it does not lie in a neat containable bodily package but is instead systematic, institutional, and environmental." Slavery takes center stage as horror in a way that strays from the trivial and centralizes the experience of the Black woman. For a genre film, films about slavery, and film in general; this is unprecedented! Beloved differs from most other horror films: it demonstrates a more dynamic and complicated discourse on repression. Rather than seeking to mask its frightening "repressed" in order to enable conceptual play and resolution, Beloved attempts to expose and reveal it’s repressed—namely, slavery—and to bring it into historical representation. The film not only raises questions about the meaning of repression during slavery, but it also comments intertextually on the repression of stories of the oppressed in Hollywood narratives of the Antebellum South. Beloved begins to enunciate a profound and difficult question, one repressed by traditional representations of slavery and one which is particularly important to African Americans in the post-civil rights, post-Black power era: what (moment, place, feeling) defines freedom for African Americans? While this question is never fully answered, both film and book suggest that freedom implies more than emancipation from slavery and that the line, both historical and geographical, between slavery and freedom is not nearly as effective a barrier as it may first appear: slavery’s menacing unfreedom continues after the Emancipation Proclamation to seep across the Mason-Dixon line. The challenge here is to imagine this body of work that stretches our imagination and understanding of the genre as a whole. 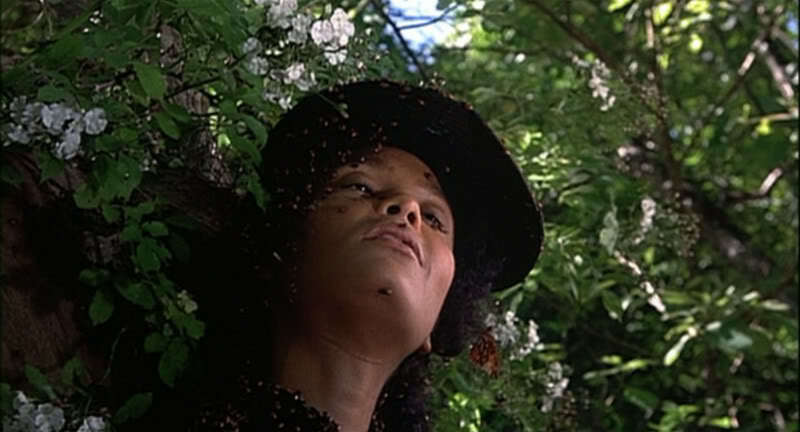 In retrospect, this film was uncomfortable to experience for these very reasons and when considering its centering of a Black female character, a viewer is forced to experience very intimately all her pleasure, joy, pain, sorrow and break from stability that humanizes and deals with her Black identity as well as womanhood.